Heat the oil in a large pan and cook the onion until soft. Add the courgettes, pasta sauce and seasoning. Bring to the boil, remove from the heat and add the fish. Cover the base of an ovenproof dish with a layer of lasagne sheets. Top with half the fish mixture. Repeat the layers, finishing with the lasagne sheets. 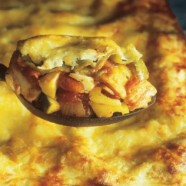 To make the topping: mix together the egg, cottage cheese and fromage frais or yogurt. Pour over the lasagne and top with the grated cheese. Serve with mini pitta or French bread.